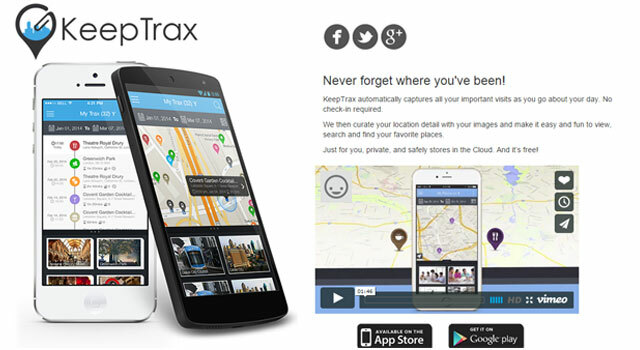 US- and India-based 'Internet of Me' mobile technology startup KeepTrax Inc. that helps people record places they have visited, has raised $1 million (Rs 6.25 crore) in seed funding led by Naya Ventures, according to a press release. The Dallas-headquartered venture has an engineering unit in Hyderabad, India. The company’s patent-pending technology platform converts people’s physical location visits into curated ‘event pins’ that digitally captures and organises details such as location name, address, dates, times, durations, photos, calendar and other context. This is done by using GPS and other mobile device sensors. The company initially focused on and built a solution for travel oriented use cases, but due to strong traction in adjacent areas it has now started to also apply its technology platform to broader applications such as field sales optimisation, rich location-based user profile generation, and life-logging. “Whether navigating busy routines near home, or discovering new places far away, people have a practical and emotional connection with the places they visit,” said Kedar Benegal, founder and CEO of KeepTrax. The company is co-founded by Benegal, who previously worked with the mobile division of Sabre Holdings and has spent the past 15 years in senior strategy, marketing and operations roles in the travel and retail industries; and Ismail Thanickel, a software architect with nearly 20 years of experience in architecting and developing complex and secure mobile communication platforms for top-tier firms including mobile communication platform provider Good Technology, Motorola and JP Mobile. “We have been hugely impressed by the KeepTrax team, technology platform, and the speed with which they have secured both consumer and enterprise market traction,” said Dayakar Puskoor, general partner, Naya Ventures. Founded in 2011, Naya Ventures invests in early stage mobile technology and cloud based companies in India and the US. Founded by Puskoor, who managed P&L for the hosting and mobility solutions business at Microsoft, it is looking to invest in firms engaged in incubation, development and management of new mobility, cloud and big data solutions.